Large cohesionless particles (Geldart Group D particles) generate a permeable plug allowing the passage of a significant gas flow volume at low pressure drops. In this case a low intensity stress would develop in the plug resulting in a linear dependence of pressure drop on plug length. Plugs of fine cohesive particles (Geldart Group C particles), virtually impermeable to gas flow at the pressures usually encountered, and in this case the plug moves like a mechanically pushed piston in a cylinder. The stress developed within the plug is in this case higher, translating in a high wall shear stress and explaining an exponential increase in pressure drop with plug length. According to this theory the degree of permeability of the plug is responsible for relationship between plug length and pressure drop, and the pressure drop across a plug can vary between a linear and exponential function of the plug length depending on the permeability of the plug. From an optimal design point of view, large cohesion less particles form permeable plugs and are therefore more suitable for discontinuous dense phase transport. In materials where interaction under the action of stress and interparticle forces give rise to low permeability plugs, discontinuous dense phase transport is only possible if some mechanism to limit plug length is used, in order to avoid blockages. Detect the plug at its formation and take appropriate action. a) the most common by-pass systems employ a small pipe running inside the conveying line, having fixed ports or flutes at regular intervals along its length. In an internal bypass system, the pressure build-up behind a plug causes more air to flow around the by-pass line and break up the plug from its front end as shown in the following figure. b) An alternative is to use an external bypass pipeline running alongside the main section and connected to it at intervals along the length. The spacing of the cross-connections to the external pipe, or the flutes along the length of the internal pipe depends upon the permeability of the conveyed material and the bore of the by-pass pipe is typically 20–25% of the conveying pipeline. 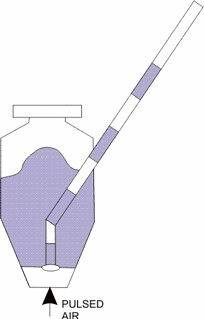 a) use an air knife to cut solids fed in continuous dense phase flow from a blow tank. b) use an alternating valves system in order to cut up the continuous dense phase flow from the blow tank. c) for free-flowing materials use a pulsed air operated diaphragm in the blow tank to create plugs. 3) Fluidization – in order to maintain the aeration of the solids and hence avoid the formation of blockages, extra air is pumped along the transport line. All commercial dense phase transport systems employ a blow-tank which may be with or without fluidizing element. An advantage of dense-phase pneumatic systems consists in the possibility of conveying friable products at extremely low levels of product degradation or damage, because solids conveying velocities usually occur in the range of 0.25–2 m/s. Such features are very important for a wide variety of food products, especially for those product prone to attrition. Food materials conveyed successfully using dense phase systems include spray-dried milk powder, sugar, powdered and granulated coffee, wheat, barley, peanuts, milled grain. Dense-phase transport blow tank with fluidizing element. In dense phase the blow tank is automatically and cyclically filled, pressurized and discharched. One third of the cycle time is used for filling, so that a system requiring a mean delivery rate of 10 tonnes/hour must be able to deliver a peak rate of over 15 tonnes per hour. Because of the high pressures involved, dense phase transport is thus a batch operation whereas dilute phase transport can be continuous (low pressures involved and use of rotary valves). One possibility for the dense phase system is to operate in semi-continuous mode by the use of two blow tanks in parallel. In cases where it is necessary to transfer solids over short horizontal distances, solids are fed on to a porous membrane, through which air is passed to fluidize the solids (air slide). In this case the solids flow easily even when the membrane is inclined at only 4 or 5 degrees with respect to the horizontal, sustained by the air couching. The design of commercial dense phase systems is largely empirically based, as theory does not provide a mature support, while dilute phase transport systems can be designed using theoretical principles and empirical correlations, always applying a large safety margin. A general test facility simulating most transport situations can be used to setup the important transport parameters during tests on a particular material: details of the dense phase transport characteristics of the material can be analyzed to set up the optimum conditions of pipe size, air flow rate, and dense phase system working mode. Theoretically any powder can be conveyed in the dilute phase mode, but because of performances of dense phase transport, it is preferable to convey powders in this mode. Dense-phase pneumatic conveying allows friable products to be conveyed with extremely low levels of product degradation or damage, because solids conveying velocities usually occur in the range of 0.25–2 m/s. Such features are very important for a wide variety of food products, especially for those prone to attrition. Food materials conveyed successfully by this system include sugar, wheat, barley, spray-dried milk powder, peanuts, milled grain, as well as powdered and granulated coffee. As already mentioned, the most commonly used procedure is to undertake a series of tests on a sample of the powder in a pilot plant (quite expensive). An alternative approach is based on similarity between gas fluidization and dense phase transport: Dixon (G Dixon. The impact of powder properties on dense phase flow. Proc Int Conf on Pneumatic Conveying. London. January 1979) proposed a method of assessing the suitability of a powder for transport in the dense phase based on Geldart’s (1973) classification of powders. He proposed a ’slugging diagram’ allowing prediction of the possible dense phase flow patterns from a knowledge of particle size and density. groups B and C are generally not suitable. Mainwaring and Reed (Mainwaring, N.J., and Reed, A.R. — “An Appraisal of Dixon’s Slugging Diagram for Assessing the Dense Phase Transport Potential of Bulk Solid Materials”, Pneumatech 3, Proceedings pp. 221-234,1987 ) claimed that Dixon’s approach gives a good general indication, but it is not the most appropriate. These authors proposed an assessment based on the results of bench-scale measurements of the permeability and de-aeration characteristics of the powder. The key characteristic is the possibility for the powders to achieve a sufficiently high permeability in the test, with higher air retention as an index of suitable transport in the rolling dune mode of dense phase flow. According to the authors, powders not satisfying previous criteria are unsuitable for transport by conventional blow tank systems. Cohesive materials represent a major problem in hopper discharge, pipeline feeding and conveying, often suggesting that innovative systems should be considered, like the pulse phase system. A wide range of materials, divided into a fine particles and dispersed in air, will propagate a flame through the suspension if ignited. These materials include many foodstuffs such as flour, sugar, and cocoa. 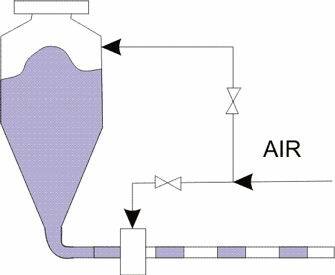 In a closed system the oxygen level of the conveying must be controlled under the fuel-air stoichiometric level, or nitrogen can be used. In an open system, adequate safety devices must be put in place, like suppressant system, or pressure relief vents. Materials containing a high level of moisture can generally be conveyed in conventional systems if they can be fed into the pipeline, and do not contain too many fines. Most of the handling problems with wet materials occur in trying to discharge them from hoppers. Fine materials may not discharge satisfactorily from a conventional rotary valve and so a blow through type should be used. Fine materials which are wet will tend to coat the pipeline and bends, and gradually block the line. Lump coal having a large proportion of fines is a particular problem in this respect. Single plug blow tank systems and some of the innovatory systems are capable of handling this type of material. If a conventional system must be used, the problem can be relieved by heating the conveying air, if the material is not too wet. If the build up of electrostatic charge is a problem when conveying a material, the air can be humidified, and the entire system and pipe-work network should be earthed. This process can be carried out on-line and does not usually require a closed system. In dense phase the quantity of air which needs to be conditioned is much less than in dilute phase systems, and so for materials capable of being conveyed in dense phase, the operating costs for air quality control will be lower. If the hardness of the particles to be conveyed is higher than that of the system components, such as feeders and pipeline bends, then erosive wear will occur at all surfaces against which the particles impact. Velocity is one of the major parameters and so the problem will be significantly reduced in a low velocity system, i.e with dense phase transport. In a dilute phase system, feeding devices with moving parts, such as rotary valves and screws, should be avoided if possible, and all pipeline bends should be protected from attrition and particle impact. Low transport velocity should be considered in this case: particle impacts, particularly against bends in the pipeline, are one of the major causes of the problem. Damage can be caused also by particle to particle and particle to wall attrition. Screws and feeding devices which can cause particle breakage should also be avoided. Granular materials can be conveyed with only few problems in pneumatic systems provided that they can be fed into the pipeline. shearing of granular materials should be avoided; in this case a valve with an off-set inlet should be used. Granular materials containing a large percentage of fines, and which are not capable of dense phase conveying, may block in a top discharge line. Air often permeates through granular materials in top discharge blow tanks and the materials do not convey, particularly if the blow tank does not have a discharge valve. An hygroscopic material can be dried to reduce the moisture level to an acceptable level. This process can be carried out on-line and does not usually require a closed system. For a material which is only slightly hygroscopic, conveying may be achieved if the material is conveyed in dense phase, without the need for air drying equipment, since air quantities required for conveying can be significantly lower than those for dilute phase conveying. A problem of pipeline coating can occur with very fine powders in the low micron and sub-micron range, as these materials tend to adhere to the pipe wall when conveyed in conventional systems. The coating gradually builds up and can cause a marked reduction in the pipe section area, and as a consequence a reduction in conveying capacity. In a conventional system the material should be conveyed through a flexible pipeline or hose so that the material build-up can be shaken on a regular basis: the natural pulsations occurring within the system could be sufficient to shake the material, re-entraining the material in the conveying line. 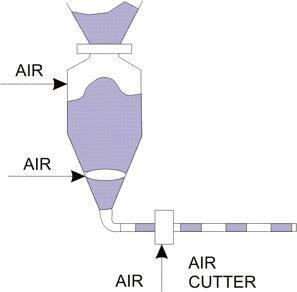 In pneumatic conveying, high pressure typically means any pressure above about 1 atm gauge. In systems delivering materials at atmospheric pressure, 6 atm gauge is typically the upper limit for the food processing industry, due to the problems of air expansion. In conventional systems the material is fed into a pipeline and either blown or sucked; in innovatory systems, if the material has no natural capability for low velocity, the material is preconditioned in some way, either at the feed point or along the length of the pipeline, usually to convey the material at low velocity and in dense phase. Food Powders - Physical Properties, Processing, and Functionality, Barbosa-Cánovas, G.V., Ortega-Rivas, E., Juliano, P., Yan, H. Springer 2005. Introduction to Particle Technology, 2nd Edition,Martin Rhodes, John Wiley & Sons Ltd, 2008. Handbook of pneumatic conveying engineering, David Mills, Mark G. Jones, Vijay K. Agarwal ,Marcel Dekker, 2004. Fluidization Engineering, Kunii, D. and Levenspiel, O. 2nd edition, 1991, John Wiley & Sons, Ltd, Chichester. Pneumatic Conveying Design Guide, D Mills, 2nd edition, Elsevier, 2004.